It's sometimes easy to forget that, as a professional sport, rugby is still a child, still in nappies and uncertain on its feet. It's growing, of course, but it's getting costlier as a consequence. The question that all unions around the world have been asking in recent times is how on earth we can afford to keep going the way we are with so many mouths to feed and only a finite amount of money to feed them with. Rugby is at a fascinating point in its development. On the pitch, there are myriad issues about the state of the product and the startling casualty rate it produces. Off the field, the conundrum is largely about money and the growing desperation for it in order to keep in line with soaring wage inflation. World Rugby, the governing body, and Agustin Pichot, its vice-chairman, came with up with a plan for a World League that would generate more money for all involved. A TV company was lined up to pay for the rights. Mark Dodson, the chief executive of Scottish Rugby, said a few weeks ago that talks are just at the "foothills" stage and that so much more detail needed to be known before any theory became reality. You can imagine Dodson's - but not just Dodson's - surprise at breakfast time on Thursday when news broke, via the New Zealand Herald, that the World League had been as good as finalised and that it was set to start next year. The sound of corn flakes being spat out would have reverberated around the northern hemisphere game. Pichot has been doing some fire-fighting ever since. As reported, the League was going to exclude the Pacific Island nations and Georgia for 12 years - and as somebody whose mission is supposed to be about growing the game, Pichot took a ferocious kicking for that. His plan was also going to add more high-intensity games to an already crazily-packed calendar and some of the stellar figures of the sport reacted quickly to slam it to the high heavens. Johnny Sexton of Ireland, Kieran Read of New Zealand and Owen Farrell of England all dismantled the notion that the body supposedly looking out for player welfare - their oft-stated mantra - could keep a straight face while finalising a vision that piled more Tests on players who are already creaking under a burden of big games. Pichot went on Twitter to shoot down elements of the published report. Nothing had been agreed, he said. He didn't want to cut the Pacific Islands and Georgia out of the loop. He wanted two tiers of 12 nations in each tier with promotion and relegation offering everybody a fair crack at the top league. No, he wasn't ignoring player welfare. No, no, no. After a while, Pichot resembled a man whose trousers had just caught fire. He seemed to suggest that he thought his plan will not come to fruition at all. He's probably got that one right at least. There's a fascinating battle going on in rugby right now and it's got a whole lot more to do with suits instead of centres and financiers instead of flankers. There's the game on the field and there's the money game off the field and both of them are hard-fought in their own way. The politics are intriguing. The Southern Hemisphere unions - Australia, Argentina, New Zealand and to a lesser extent South Africa - are struggling financially. Australia and Argentina are especially worrying cases. A great Puma scrum-half in his day, Pichot's plan involved aggregating TV revenues between the Six Nations, the Rugby Championship, plus supposedly exploitable markets in the two other teams that had been slated for Tier One - Japan and the USA. All the lucre would be in one big pool and every country would play each other once a year with play-offs and a grand final to round it off. In the north, there wasn't a whole lot of truck for this idea. There were issues like player welfare, and concerns about the World Cup being devalued - Pichot's plan had it that a world champion would be crowned at the end of every season except in a World Cup year - and a possible threat to Lions tours. The Six Nations is utterly opposed to promotion and relegation and that's another nail in the proposed tournament. The way rugby politics works, these things could, in theory, be overcome. The main problem is about - and always will be about - money. The way the north see it, the World League is a bad financial deal for them. They'd be bringing more TV money to the table but would only get the same share as the other six. How is that fair or appealing? It would be good news for Australia and Argentina, but northern hemisphere money going south is never going to work. "If you think we're going to fall for this then you have another thing coming," was the gist. To some, who are against the idea, it is an attempt to save struggling Southern Hemisphere unions with northern hemisphere cash. Also, it's an attempt to maintain World Rugby's commercial relevance in a fast-changing landscape. World Rugby know that the Six Nations are exploring an idea that would see them pool their own TV revenues for the first time for their championship and autumn internationals. They've even got a name for the concept - Project Light. They're on the lookout for 'partners'. 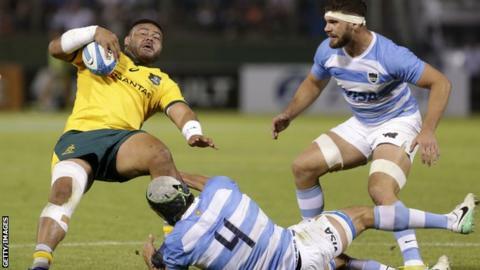 If that deal comes to pass then a World League is dead in the water and the financial problems of Australia and Argentina, in particular, carry on. The game is altering in front of our eyes. Dodson talks about a changed financial picture in the sport. The driver was the private equity firm CVC Capital Partners, who last year paid more than £200m for a 27% share of Premier Rugby Limited (PRL), the governing body of the top division in England. Now everybody is looking for the next CVC. Money has never been more needed and more talked about. "Investors are interested in our game at multiple levels," says Dodson. "The PRL deal was like a new herald for the sport in many ways. What you found was a major finance house that saw latent value in rugby. I've been in this space for two years and it's clear to me that sports financiers around the world have come to this space as well. "You can be frightened of it or you can embrace it. You can say, 'My goodness, £200m going into the English Premiership is going to cause us problems' or you can ask, 'If they can do it down there then what is the value of our Pro14?' It's very interesting. I said this day would come and it's here. "These equity firms see untapped value in rugby. The game is being seen in a different way than before. A growing game needs more cash as a buffer against annual inflation. The PRL did a deal - good luck to them - and I'm hoping that we [Pro14] are next. We're at the foothills, but watch this space." Dodson wouldn't be drawn on the mooted World League, but others say that unless the finances get recalibrated then it's not going to happen. Even Pichot didn't seem at all optimistic on social media. Rather than being a tournament on the way in, it looks like a tournament on the brink. The money question will continue, though. The search for more cash to support an increasingly expensive sport will continue, phase after phase after phase.